CONTRIBUTE TO OUR DISCUSSION FORUM! Perhaps, rather than talking about Mahayana Buddhism, we should be speaking of Mahayana Buddhisms. There are numerous schools that are a part of this wide branch of Buddhism, and on this site (home) we are devoting individual sections to some of the bigger or more influential ones (Zen, Soka Gakkai, Tibetan, etc.). However, there are certain items that clearly distinguish the Buddhism of the Mahayana movement from Theravada Buddhism, the lone survivor of the various early schools. This section will bring together some of the points that are generally shared among the Mahayana schools, albeit in highly creative ways. How creatively? Click here for the chart of Buddhist schools located in the "Basics" section. The one school of which we shall make particular mention in this section is Tendai, sometimes called the "rationalist school," because in many ways it is the most straight-forward exemplification of the fundamental Mahayana attributes. Mahayana is usually translated along the line of "The Great Vehicle." Maha means "great," "large," or "big," and yana presumably means "vehicle" or "raft." Unsurprisingly, one doesn't have to look too far to find some scholar or other who disagrees with that translation. For our purposes, we can go with the traditional meaning, but we need to address the question of why this branch of Buddhism calls itself "maha." Does it mean "big" in the sense of size or "great" in the sense of excellence? This point has been commented upon numerous times because, for one thing, its meaning will have implications for the meaning of the other branch, referred to by the Mahayanists as Hinayana, "The Small Vehicle." Both connotations are included in the terms hina and maha. For one thing, it can refer to the "size" of the raft. How many people can it accommodate? More directly, how many people are able to attain Nirvana on the basis of what this branch teaches? As discussed under the Theravada section, the earliest schools of Buddhism were pretty much united on the idea that only a few people, namely the bikhus who had been successful in becoming arhats, could find enlightenment. Mahayana teaches that every sentient being can achieve, not only the somewhat limited enlightenment of an arhat, but even Buddhahood. 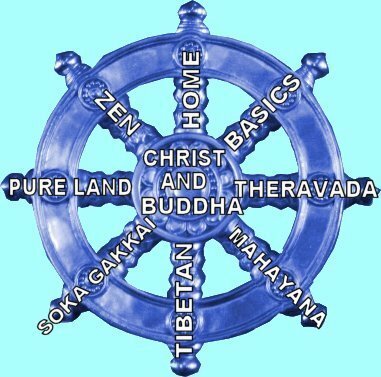 Thus, we can say that, in terms of how many people can be accommodated, Hinayana is the small raft (or, shall we say, "minibus"), and Mahayana is the large raft (or large luxury bus, to continue the metaphor). The above is true, but does not go far enough. Because Mahayana can supposedly provide for so many more people and give them so much more (Buddhahood rather than arhatship), when the innovators of this terminology called themselves "Mahayana," they also meant it in the sense of being the greater, better, and superior school. For them "Hinayana" was a derogatory term, which they inflicted on the previous monks-only schools, and the adherents of the latter groups were not entirely happy with that put-down. 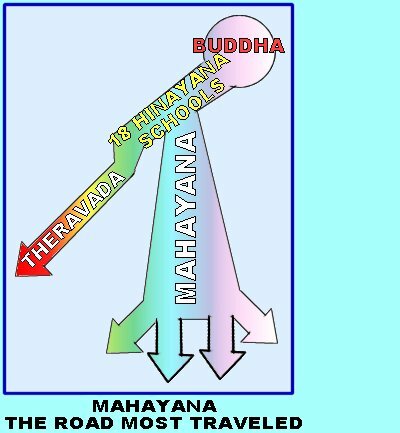 On this site we are following the convention of using "Hinayana" as a collective term for the eighteen or so early schools, but not as a synonym for Theravada, which is the only one of those schools that still exists. (Though, to be honest, I've heard quite a few Theravadins refer to themselves as "Hinayana," which I take to mean that the term is not really as pejorative as is often claimed.) The important point for us in this semantic exercise is what it says about how the followers of the Mahayana branch thought about their teaching. The fact that it gave a greater chance for Nirvana for more people was a given, but they also felt that it was, therefore, better and that it was the pure and true message of the Buddha, which had been concealed by the Hinayana teachings. 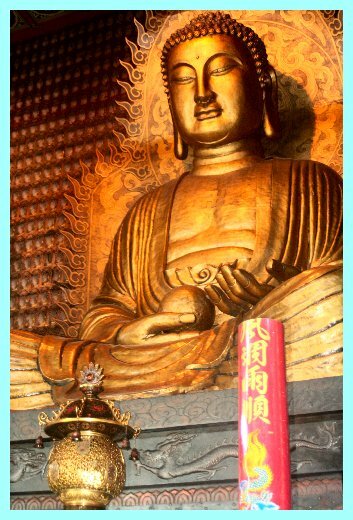 Mahayana Buddhism is frequently also called "Northern" Buddhism. Theravada happens to be at home these days in southern countries, such as Sri Lanka, Thailand, or Cambodia. Mahayana, just like Theravada, had its beginnings in India, and its first full expression may very well have come about in the northern part of the subcontinent. But even more so, it was the Mahayana form of Buddhism that exported itself to China, Tibet, Korea, and Japan, to mention some of its most important locations. In India, its country of birth, neither form of Buddhism has a strong presence any longer. Conceptually, Mahayana Buddhism very likely arose out of the beliefs of some of the early schools other than Theravada, for example the Mahasanghikas as well as the Sarvastivadins and Sautantrikas . Clearly, though, it also received a lot of new creative input from within. Mahayana Buddhism showed itself to be quite adaptable, accommodating, say, Hindu, Chinese Daoist, or Japanese Shinto notions along the way. Furthermore, as the various forms of Buddhism spread, they would meet again far from their early geographical origins, and cross-fertilization of ideas and practices would take place. Any sentient being can become a Buddha. Therefore, a person does not need to be satisfied with just being an arhat. There exist many Buddhas and Bodhisattvas at the same time. Many Buddhas are "transcendental" Buddhas, which means that they exist in the highest realms above heaven. Bodhisattvas are beings who could become Buddhas any time, but they have postponed their final step into enlightenment so that they can help others find redemption as well. As reflected in the previous point, compassion becomes an important theme in Mahayana Buddhism. Mahayana took the step from denial of the reality of a self (anatman) to accepting that ultimately everything is emptiness (sunyata). There were several philosophical schools of thought on how to understand this phenomenon. The question of exactly what to believe and how to practice Buddhism gave rise to many schools.